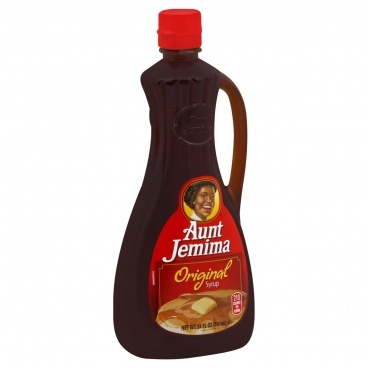 Give your pancakes what they deserve and top them with the classic taste of Aunt Jemima Original Syrup. This rich and thick American Aunt Jemima syrup is the perfect way to top your familyåäÛªs favorite pancakes and waffles. Ingredients: Corn Syrup, High Fructose Corn Syrup, Water, Cellulose Gum, Caramel Color, Salt, Sodium Benzoate and Sorbic Acid (Preservatives), Artificial and Natural Flavors, Sodium Hexametaphosphate. *Corn Syrup, *High Fructose Corn Syrup, Water, Cellulose Gum, Caramel Colour, Salt, sodium Benzoate and Sorbic Acid, Artificial and Natural Flavours, Sodium Hexametaphosphate. Produced from genetically modified maize. **May have an adverse effect on activity & attention in children. Pancakes and syrup, add some bacon and its heaven on a plate!